15% of the world’s bird species. 4 UNESCO World Heritage Sites. #1 most biodiverse country in the world. Andean cloud forests. The jungles of the Amazon. Pristine beaches along the Pacific, and breathtaking snow-capped volcanoes and mountains. In a single country, it could only be Ecuador. Ecuador, taken from the word equator, serves as the perfect name for a nation that sits right between the modern world and a bygone era. 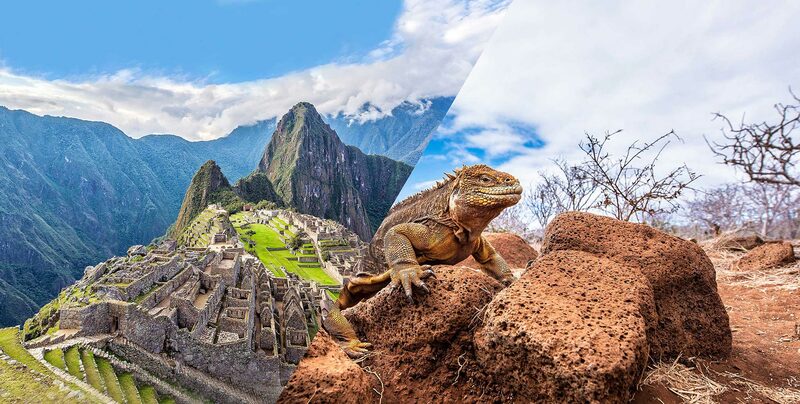 Travel to Quito, the nation’s capital and a UNESCO World Heritage Site, with its striking views of snow-capped volcanoes and its historically stunning Old Town. Or explore Guayaquil, a bustling, beautiful port city. The highest concentration of unique species in the world. Numerous ways to explore nature and embark on adventure. A once-in-a-lifetime experience as timeless as the islands themselves. The Galapagos Islands consist of 21 islands (14 of which can be visited) and dozens of islets and rocks spread out across 17,000 square miles (45,000 kilometers) of ocean. Undiscovered by humans until the 16th century, the islands still remain relatively untouched and continue to function as a living laboratory of evolution. Hundreds of thousands flock from all over the globe each year to see this rare sanctuary of nature for themselves. All visitors must begin their journey from the mainland of Ecuador (which governs Galapagos), located about 621 miles (1,000 kilometers) away. Let our Metrojourney’s Travel Experts guide you through this destination. Discover all the ways to see Ecuador and Galapagos. Our grand variety of tours offers something perfect for everyone. Have any questions? We’ve got answers. Fill in the form below and let’s start talking!